Spanish Steps at sunset - Rome, May 2009 - 30 | Flickr - Photo Sharing! Note: this photo was published in a Jun 16, 2010 blog titled "What To Do When You Hit A Plateau In Your Language Studies." It was also published in an undated (early Feb 2011) Norwegian blog titled "Åndelig lesning." Moving into 2012, the photo was published in a Jan 28, 2012 blog titled "Reasons Why Spiritual Development is Not Given Its Due Emphasis." It was also published in a Mar 5, 2012 blog titled "Piensa en usar todos los obstáculos como escalones para construir la vida que quieres – Marsha Sinetar." And it was published in a Mar 12, 2012 blog titled "Will Love Prevail as the Core of Christian Faith?" 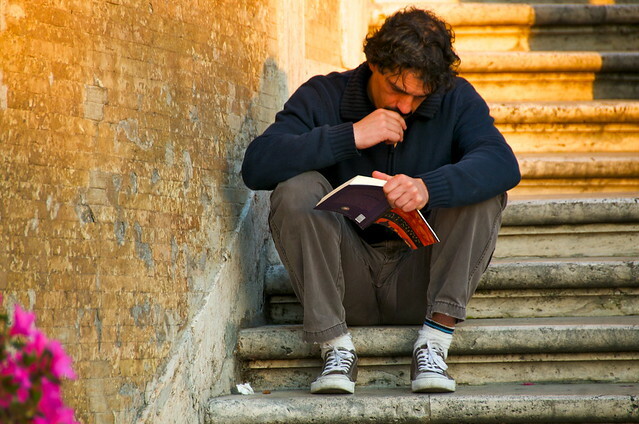 It was also published in a Jun 27, 2012 blog titled "Reading in Italy." And it was published in a Jun 29, 2012 blog titled " Prisioneiros brasileiros reduzem penas lend livros." It was also published in an Aug 31, 2012 blog titled "L'effet de la lecture est comparé au fitness." Moving into 2013, the photo was published in an Oct 4, 2013 blog titled "What we’re reading: A new review of landscape genetics, science in the shutdown, and how to not be That Dude." Moving into 2015, the photo was published in a Jun 19, 2015 bog titled "THE 45 BEST BOOKS TO READ ON THE ROAD." zaimos, denny.lyon, visser62, and 10 other people added this photo to their favorites. How do you come so close to peple ?? schönes Foto !! !